Myanmar: 25. Procession - Becoming a novice monk? 25. Procession - Becoming a novice monk? Around Dec 30, 2008, I saw a procession along the road from Pyin Oo Lwin to Mandalay. Boys of around 7 years old sitting on ponies lead by man to a temple probably. Young girls in their best dresses sitting in carriages. White cows pulling several carts and slowing traffic. Golden umbrellas. Flowers and lots of people. Long procession. Dust. Diesel smoke. Extremely colourful. Something important was going on. My tour guide was unable to explain to me in English as to what's was happening. He was a man of few words. The driver could not speak English well. From what I read, I presume the boys were being sent to become novice monks. The girls were to have their ears pierced for wearing of ear rings. And one other reason. I shall be most grateful if you will explain to me what's the tradition. My Canon EOS 40 D camera broke down. Camera just would not focus after the Myitkyina trip a few days ago. Maybe the rocky trip in Myitkyina upset the branded Canon digital camera lost its focus bearings. I was cursing as I expect a branded new camera to be reliable. Lesson learnt: Always carry a backup camera on your tour. Have a Plan B. 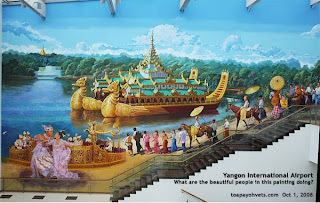 Picture from Yangon International Airport's Wall painting is similar to what I saw. Some artists have painted such scenes too. Will be great if your father can explain in English the custom and tradition of what I saw.